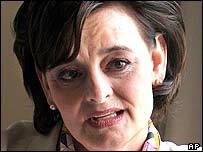 Cypriot President Tassos Papadopolous has criticised Cherie Blair's decision to represent a British couple in a land dispute in divided Cyprus. Mrs Blair, a lawyer, said she will represent Linda and David Oram, who have been embroiled in a row over their home in northern Cyprus. President Papadopolous said it was "provocative" for the wife of the prime minister to be involved in such a case. But Downing Street said she was acting purely in her professional capacity. "It's a provocative action as it is difficult to separate her professional capacity from being the wife of the British prime minister," Mr Papadopolous said. "We will take the issue up with Britain." Mr and Mrs Oram had built a house on land bought in the village of Lapithos in northern Cyprus. They were ordered to pay compensation to a Greek Cypriot refugee, Meletis Apostolides, who left his home when Turkish troops landed in 1974. A court in Cyprus threatened to seize the Orams' property in England if they did not comply. Because the ruling cannot be enforced in the northern part of Cyprus - a state which only Turkey recognises - Greek Cypriot lawyers have taken the dispute to the British High Court. Cyprus has become part of the EU, which gives it greater strength for the Cypriot court to seize property in Britain. The Cypriot government estimates there are as many as 10,000 foreigners with Greek Cypriot property in the north.